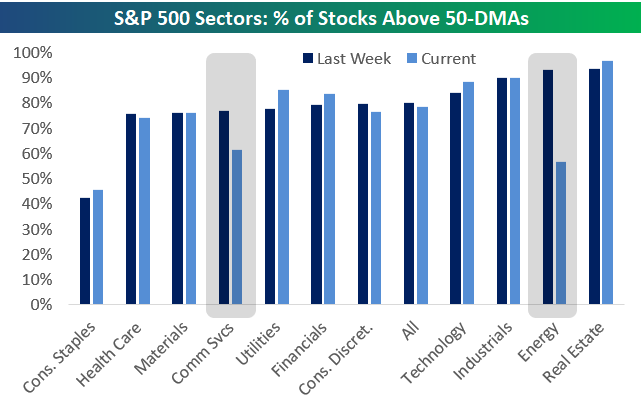 Below is one of the many charts included in this week’s Sector Snapshot, which shows the percentage of stocks trading above their 50-day moving averages by sector. For each sector, we show current breadth levels versus where they were one week ago. As you can see, breadth for the entire S&P 500 has fallen slightly since last week, but the majority of the decline has come from big drops for two sectors — Energy and Communication Services. Other sectors like Technology and Financials have actually seen breadth strengthen since last week.